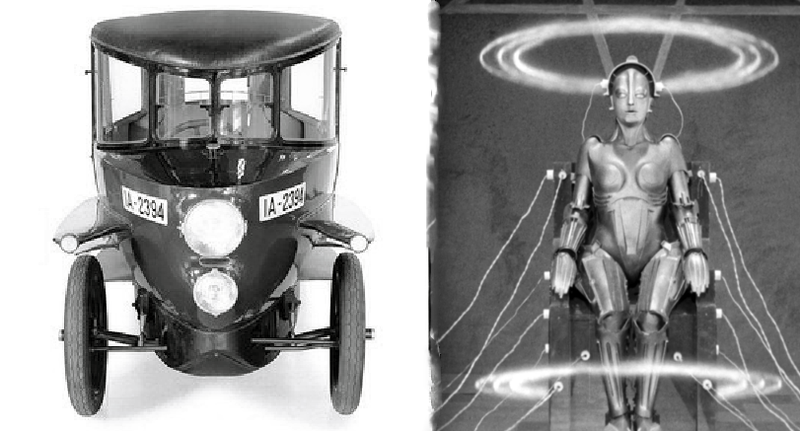 Everything in Fritz Lang’s epic film Metropolis was carefully considered–even the cars. 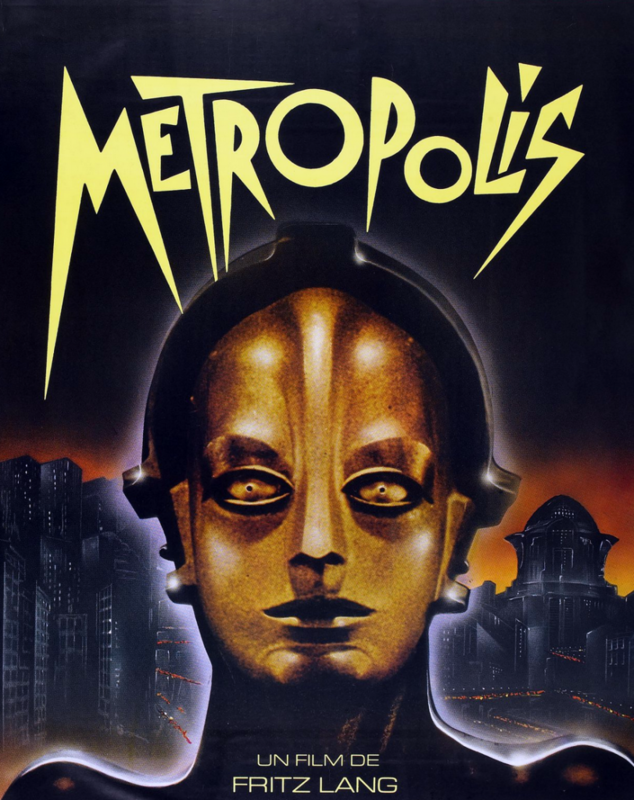 No college film course is complete without a serious look at Fritz Lang’s 1927 epic Metropolis. Best known for its pioneering futurism, cutting-edge directing, and dystopian prognostication, the film is a must see for movie lovers. I find the sets especially compelling. The huge “machine” seen often in the film is a perfect and visually stunning metaphor for society’s casual disregard for the humanity of its workforce. But, as I am not a social scientist, there is something I find even more compelling about Metropolis: the cars. Any serious film depicting the future must deal with—or work around—the vehicles of the era in which it was made. The challenge is to convincingly depict the transportation of tomorrow by using the technology of the present. This is still a significant hurdle for filmmakers today; it must have been especially difficult in the Twenties. The Rumpler Tropfenwagen was offered in a number of configurations, each of which evolved over the vehicle’s short production lifespan. Establishing shots of the unnamed city in Metropolis include personal aircraft buzzing uniformly around the huge buildings—many of which are designed with projections large enough to serve as runways for these small planes. But, there’s plenty of ground traffic seen too, and this is where things get interesting. As I watched the film for the fifth or sixth time, I noticed that most of the cars seen hustling about the city feature rounded, surfboard-like roofs, an obvious nod to the likelihood that future cars would be more aerodynamic than the cars of 1926—a solid guess. 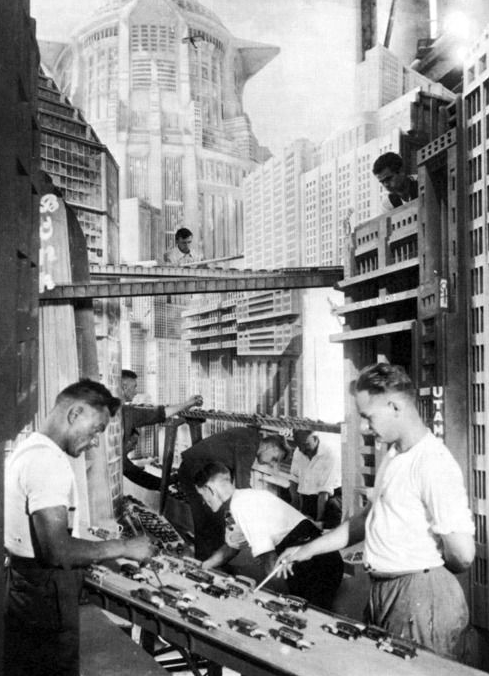 All the models in this Metropolis scene appear to be Tropfenwagen variants, except, perhaps, for the two in the lower left corner of the frame. What I didn’t realize is that ALL of the cars in Metropolis were based on the basic design of one real-life automobile: the Rumpler Tropfenwagen. As you might expect, Rumpler is a person, and we’ll talk about him in a moment. “Tropfen” is the German word for drop, as in water drop. 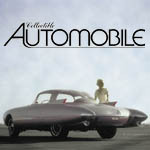 The name was well chosen, as the streamlined Tropfenwagen is among the first intentionally aerodynamic-looking passenger cars, comfortably predating better-known streamliners such as the Chrysler Airflow and the Tatra V570. Based on the scale of this model set, the Metropolis production budget was likely larger than that of other films of its day. Rumpler company founder Dr. Edmund Rumpler came to his interest in aerodynamics the honest way, by having worked first in the airplane business. One of Rumpler’s planes, the C.IV, was popular with German reconnaissance forces because of its reliability and capability of flying at very high altitudes. One tenet of the Treaty of Versailles (the primary treaty that brought World War I to an end) forbade German aircraft manufacturing, leaving Rumpler without a post-war job. At this point he turned to building cars. The general public got its first look at the Tropfenwagen at the 1921 Berlin Auto Show. Strikingly different than the other cars on display, the Wagen’s rear-engine design allowed for a grilleless, rounded front end that was highlighted by a single center-mounted headlight. The Wagen’s roof was both rounded and tapered downward at the front—and, on some models, featured curved front glass. Recent tests at a Volkswagen wind tunnel confirmed what most informed observers suspected: the Tropfenwagen was actually very aerodynamic. Per the VW testing, the tested version of the Tropfenwagen boasted a drag coefficient of .28—about the same as a current-generation Chevrolet Corvette, and simply incredible for vehicle designed in the early Twenties. The Wagen was just as interesting mechanically as it was design-wise. A W6 engine powered early versions of the rear-drive, rear-engine Rumpler. The unique powerplant featured three banks of two cylinders, good for 2.3 liters of combined displacement and 36 horsepower. Period tests reported that the Tropfenwagen could reach 70 mph with little difficulty. 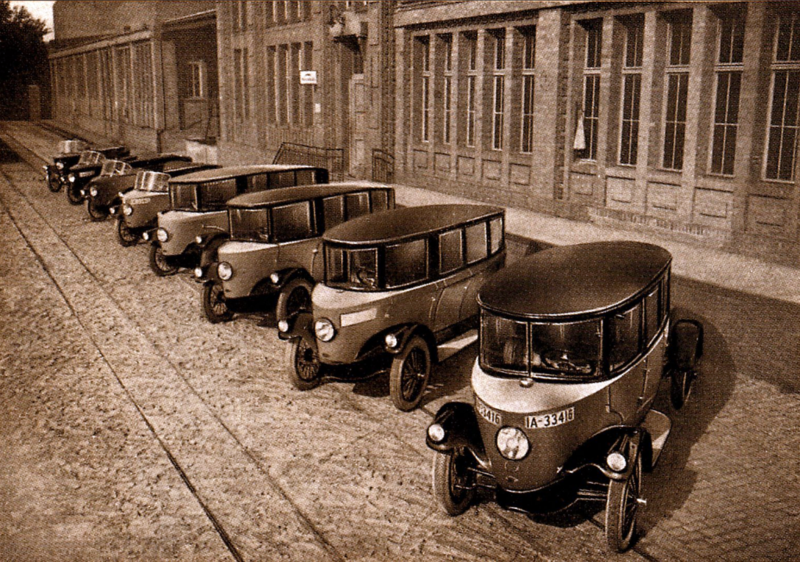 Models built in 1924 and 1925 were equipped with a Mercedes-Benz-supplied 2.6-liter inline four, which was reportedly more reliable and less expensive to build. 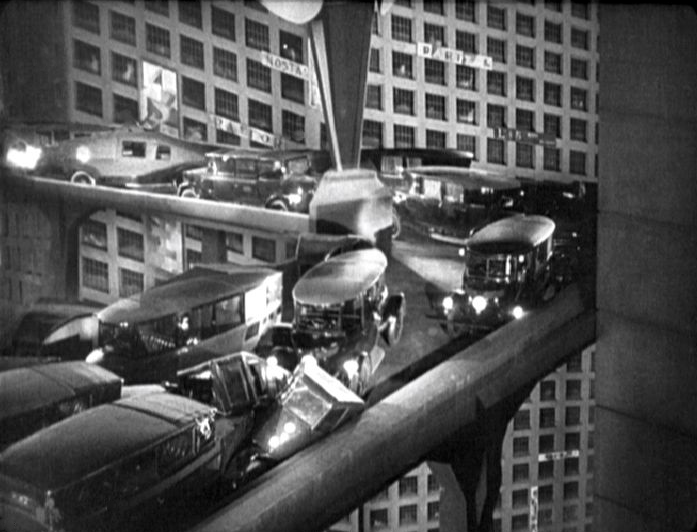 Clearly taken by the car’s design, Metropolis director Fritz Lang chose the Tropfenwagen as the only car to appear in his film (at least I think so…you can watch the film and judge for yourself). There are two specific scenes in Metropolis in which we get a pretty solid look at the cars involved. The first scene, a pileup on an elevated ramp, seems to include almost every Tropfenwagen variation built. What’s most interesting about this scene is that all the cars are models. That said, I am not certain that the two cars in the lower left-hand side of the scene are Tropfenwagens—as all the other models seem to be. 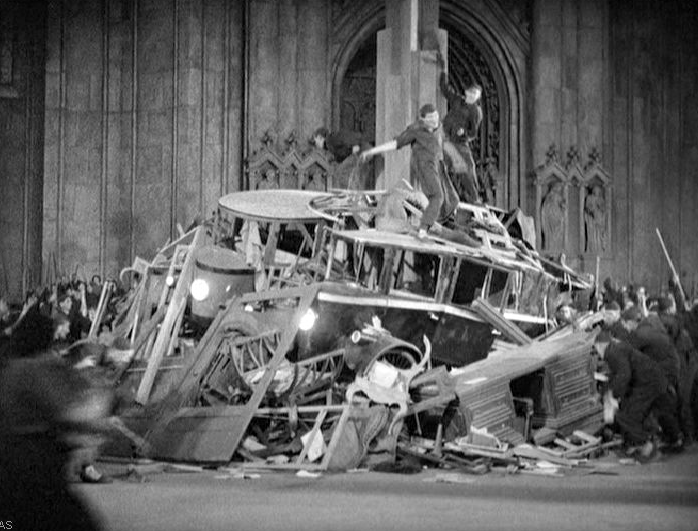 Two real full-size Tropfenwagens meet their demise later in the film, serving as part of the aggregate clutter amassed by rioters as part of a public stake-burning execution (this is a crazy movie). Most accounts put total Rumpler production at around 100 units for the company’s 1921-1925 lifespan, all of which were in the Tropfenwagen series. There seems to have been a considerable number of running changes to the design of the car, with a great number of variations coming in the form of windshields, fenders, and side glass. Unfortunately for modern-day collectors, these Tropfenwagens are not models. No word on whether or not this pair was drivable after this scene was filmed. Watching this remarkable film today, I can say with certainty that Fritz Lang chose very well when he selected the Tropfenwagen to appear in Metropolis; it’s a remarkable vehicle that truly looks and feels distinct from the other cars of the film’s era. Of course if you happen to watch the film—and you absolutely should—you’ll see that everything realized as futuristic by Lang was carefully considered. This 1921 Rumpler Tropfenwagen would have been powered by the company’s unique W6 engine. Damon Bell and John Biel contributed to this post. Written by: Tom Appel on November 1, 2017.on November 16, 2017.